After four decades of consistent opening-up and domestic reform, China has made great progress and significant contributions to global development. The continued liberalization of the financial sector is one of the hot topics being discussed at today’s China Development Forum session. After heated discussions in the morning we are now entering a false session of this forum and this forum we're going to talk about financial development and financial stability. Over the past year the Chinese government has announced a number of measures to further its openness. We have relaxed. Limitations for entry of foreign capital. We have the highest interconnectivity between domestic and abroad in terms of capital and the Chinese financial sector is now opening its arms to welcome investment from the whole world. And this is conducive for China to improve its business environment. This will also bring benefits to all the peoples in the world. But this does not mean that we are going to relax all regulations. This does not mean that we will not be guarding against the potential risks. What are the results of those measures for openness. And what are the areas to before they are opened in the financial sector in the future. How do we continue to improve our regulation in the future and how do we guard against risks and problems. I think these are the questions that you all have on your mind. So we are very pleased to invite two very important figures in the financial feud. The first is the president of People's Bank of China amidst the other guest we have at this session is Jacob Lew former U.S. treasury secretary. First that's warmly welcome Mr. Egan to address the flaw. Thank you very much the moderator. Ladies and gentlemen dear friends. Good afternoon. 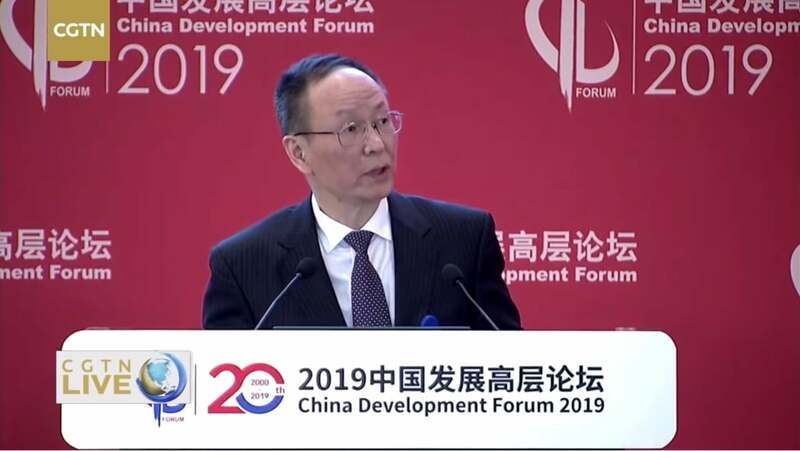 It's a great pleasure for me to be here at the 2019 China Development Forum. I feel very glad to share with you the process of China's financial developments over the years the financial sector has continuously develops and it has supported China's economic developments. We have indicated the risks. We have engaged continuously in reform. On the one hand we have guaranteed sufficient liquidity on the Chinese market. Secondly we have supported key areas and the weak links in China's economy in the food bank loans in supporting private enterprises and also in innovating the supporting tools for equity financing of private sector. We have made significant efforts and by doing so we have improved the business environment for private businesses. Third we have maintained a very stable macro leverage ratio and. We have balanced our economy from both home and abroad. We have maintained a relatively stable currency exchange rate for the RMB and [inaudible]. We have continuously promoted financial openness and we also improved the formulation of market oriented currency exchange rate for the RMB. What I want to specifically focus here is to talk to you about Financial openness which is the major work our art. China has made significant achievement in this aspect in terms of financial services. As you know that President Xi Jinping announced in April. They were formed out of the financial sector will go into is going to strengthen the reform. It is better to be early and late. Better to be quick than slow and then the PBC announced a timeline of these reforms. Last year we have introduced 11 measures and have defined the timeline for all those measures. To this day most of these measures have been translated into practice. A few of them have been put into practice. We are in a process of finishing process of legislation. We have already started the approval process.